The area currently known as Alexandria originally sat on the edge of Bradford, a collection of small farms along a small peninsula created through land reclamation efforts in the mid-1700's. In 1799, shipping magnate Jonas Clark granted a large endowment to tiny Ephesus College, which purchased land in the area. During the following century, the college expanded to become Ephesus University even as the city grew to engulf it. Much of the growth around the university consisted of tenements for the immigrant workers who built the city’s early industry. A thriving “sin” section of town also grew up in the area, catering to both the immigrant workers as well as university men seeking illicit gambling and other thrills not suitable for polite company. During the 1880’s, as public libraries grew across the nation, pressure began to build to construct one in Bradford. Eventually, a delegation approached Othniel Brown, an attorney and the wealthiest man in the city at the time, seeking his support for the library. Brown, eager to restore his family’s good name after the disgrace of his brother Hezekiah (recently hanged for a series of gruesome murders), agreed. The wisdom of putting a brand new library in an area associated with vice and sun was questioned at the time, but Paul Alleyn, the architect of the Central Library, would hear none of it, and meticulously planned the construction down to the very inch of placement for its cornerstone. The fire of 1908 devastated Alexandria. The Central Library was the only large structure in the area to survive. Due partly to the cheap land cleared by the fire, the authorities of the newly united Titan City chose a location near the library as the site of the newly formed city government. It was on this site where, in the fall of 1908 Oswald Lawrence gave his now famous “like a phoenix, we will rise from these ashes” speech. “Old” City Hall was built on the spot where that speech was given not long after, using the foundations left behind by the fire. It hosted the city’s government until 1960, when “New” City Hall was completed behind it, with the administration buildings then torn down and the vacant space created becoming the Phoenix Plaza we know today. After the fire, the university rebuilt, quickly followed by the seedy support area for students, which ultimately took the name “Olympia” from one of its popular clubs during this era. 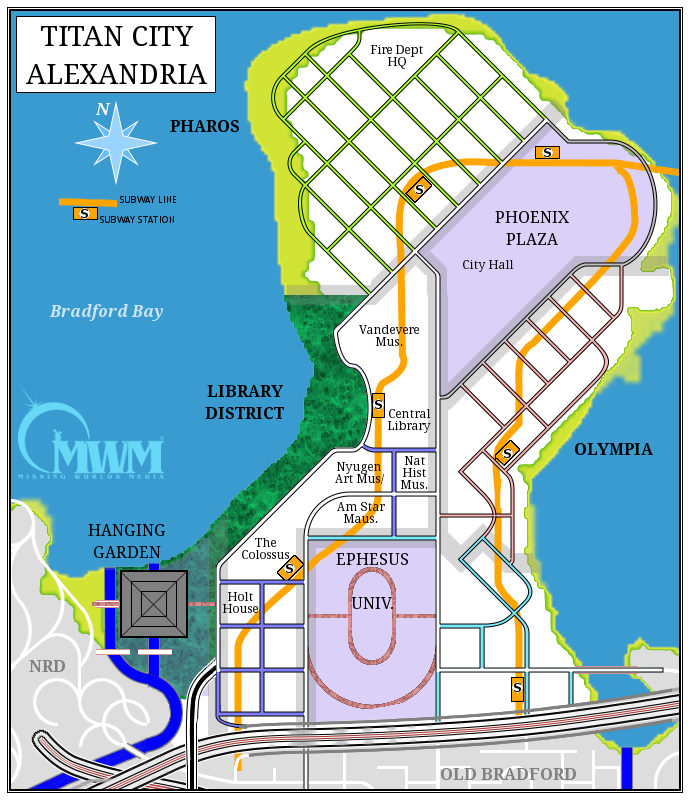 Embarrassed by having its offices so close to such a dingy area, city officials routinely complained about the need to “clean up Alexandria.” Along with the open land and low prices, this soon led to a drive to create a new array of public buildings in the area, to push the unwanted elements out. Most of the Library District’s museums and other landmarks date from this period. The Titan City Fire Department also built its new home base, the Pharos Fire Station, in the area, where it faced its darkest hour. When university officials complained about a lack of “greenspace” in the area following the efforts to replace vice with culture, EdenTech responded with the construction of an impressive “vertical park,” a sort of arboretum, a structure now referred to as the “Hanging Gardens." The Postmodern Nguyen Art Museum completed in 1998, soon after Hurricane Atlas, is the latest museum to open within the district. Fulfilling Oswald Lawrence's vision, the new Alexandria is a center of culture, a bright beacon for a city which has faced much tragedy over the years. Ephesus University is the city's Ivy League Institution of Higher Learning. The university complex contains lecture halls and offices dating back to just after the Great Fire, featuring many green-spaces, sculptures, and walkways. The Library District is home to Titan City’s Central Library, a showpiece of architectural achievement and an uncontested volume of rare documents, manuscripts, and scrolls. Many of the structures in this neighborhood are museums or other public buildings, have a more open feel, and are set back from the street with many featuring immaculate landscaping. Phoenix Plaza is the seat of Titan City’s government, as well as a number of other key buildings such as “Old City Hall,” which is now a museum dedicated to the history of the city. The plaza features a large open area, surrounded by buildings, and sports the statue of a phoenix holding the globe made famous in so many Titan City tourism advertisements. The closest thing Alexandria has to a seedy side, Olympia is an older area, mostly catering to the students and professors of Ephesus University. Here can be found cheap housing, cheap bars and clubs, cheap food, and cheap criminals seeking to prey on nerdy types who aren’t likely to offer much resistance.